Posted by Equestrian Western Australia on 01/06/2017. August hails the arrival of the Junior World Vaulting Championships, this year held in Ebreichsdorf, Austria, and we are pleased to announce that WA's own Kieran Halliday qualified for the event. Kieran has worked exceptionally hard over the last few years and has been rewarded with the opportunity to compete at Junior Worlds. Not only is he the first Western Australian to represent the country, he's also the first junior male to represent Australia, both as a member of a squad and as an individual. He was a member of Team Zelos in 2015. This will be Kieran's last chance to compete as a junior, as he turns 18 next year and will be competing as a senior. His future aim is to get to the World Equestrian Games in 2022. 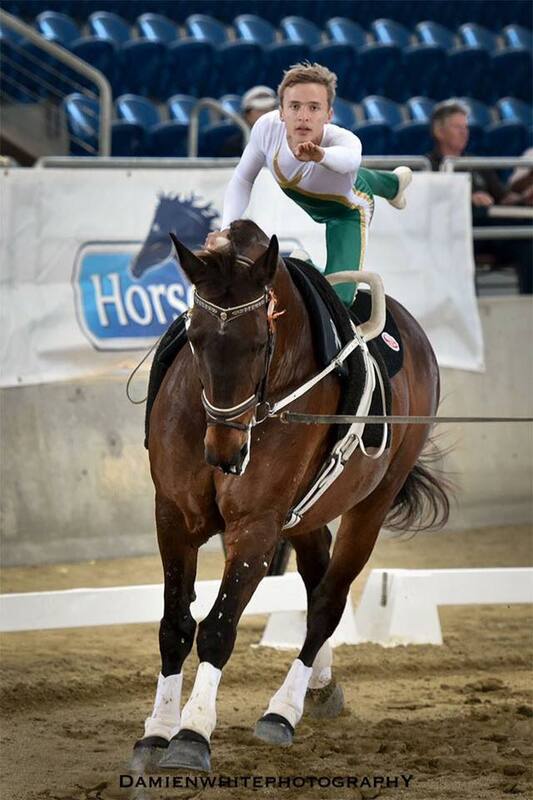 At home, Kieran coaches at RDA, and trains vaulting horses with his family, while also flying interstate to train with the National High Performance squad. If you would like to be a part of history and help get Kieran to Austria, please consider contributing to his Go Fund Me campaign.